Annual rents in the Etihad Towers apartments range from a low of Dh100,000 (US$27,227) for a 67-square metre one bedroom to Dh972,000 for a 732-sqmetre penthouse. A two-bedroom, 160-sq metre apartment is listed at about Dh225,000. Al Ain Tower, which is expected to offer similar pricing, is also scheduled to open by the end of October, agents have been told. Nation Towers is likely to open in the spring. The new apartments, along with the recently opened Capital Plaza near the Sheraton Corniche, are already popular with home hunters. People looking to rent who are willing to pay for top-of-the-line luxury have few options in Abu Dhabi. A 7,500-sq foot penthouse with a wide terrace in Al Bandar on Raha Beach is currently listed for Dh600,000 a year. On the main island, a 10,700-sq ft penthouse in Khalidiya is available for Dh800,000 a year. But the new towers will add variety and depth to the menu of choices in the city, offering a lifestyle “not really offered yet in Abu Dhabi”, Mr Maisfield said. The projects include the types of pools, saunas, health clubs and restaurants with spectacular views that are still a rarity in central Abu Dhabi. “They have the amenities and the location,” says Eduarda Silveira, a consultant with the estate agency Better Homes. The new choices could put further pressure on already falling rents around the island. The average rent for a two-bedroom apartment is down more than 40 per cent since the peak in 2008, according to Jones Lang LaSalle data. Most analysts expect rents to continue to fall in the next year as more projects come on to the market. Asteco has also said that new projects are “leading to a significant rise in leasing enquiries, predominantly from existing residents looking for better value for money and upgrades”. The new towers on the Corniche are coming on to the market at the same time as thousands of apartments are being completed on Reem Island and Raha Beach. 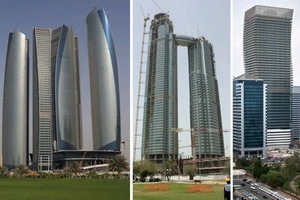 Jones Lang LaSalle predicts that 16,000 new homes will be completed in Abu Dhabi this year. But some experts doubt the Corniche towers will draw people away from the off-island developments. “It’s a totally different product,” says Ms Silveira. Reem and Raha developments are attracting younger renters and people looking for an easy commute to Dubai, she said. The Corniche projects will probably attract older renters and families that want more of a city lifestyle. But annual rents of more than Dh150,000 for a two-bedroom apartment will put off many people. At that price, they have the option of paying less to lease a villa, which is the preferred option for many families. Two-bedroom villas in Abu Dhabi rent for about Dh110,000 a year, according to Asteco’s latest research report. But the new towers on the Corniche will make home hunters think twice about their current apartments. Managers of older buildings may find it difficult to keep current tenants, unless they lower rent and upgrade their services. “We will see a flight to quality,” says Mr Agmyren.